FAYETTEVILLE, Ark. 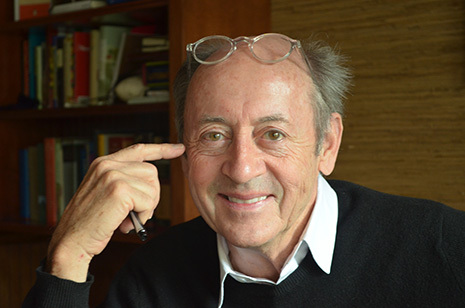 – Acclaimed American poet Billy Collins has been named the editor of the Miller Williams Poetry Series, published by the University of Arkansas Press. As editor, Collins will be ultimately responsible for the books published through the series and for choosing the winner of the annual $5,000 Miller Williams Poetry Prize. The Miller Williams Poetry Series has its roots in the Arkansas Poetry Prize, first awarded in 1990. In 2002 poet Enid Shomer became the editor, and in 2009 the press began to offer a $5,000 prize — one of the largest of its kind in the country. A concert by Lucinda Williams, the Grammy-award-winning daughter of Miller Williams, established funding for the prize. Under Shomer’s leadership, the poetry series published almost 50 books and garnered several awards, including the Kate Tufts Discovery Award, the Paterson Poetry Prize, the Brockman-Campbell Book Award, and the Library of Virginia Poetry Award. The University of Arkansas Press accepts submissions of manuscripts for the prize year round. As many as four of those manuscripts (the winner and up to three finalists) are selected for publication. The winner receives $5,000 in cash in addition to publication. Miller Williams, over the course of a teaching and publishing career that lasted four decades, published over a dozen of his own books of poetry and literary theory. In 1997 he read his poem “Of History and Hope” at Bill Clinton’s second inauguration. Today he is professor emeritus at the University of Arkansas in Fayetteville, where he lives with his wife, Jordan. Billy Collins is the author of 11 collections of poetry. A distinguished professor of English at Lehman College of the City University of New York and a distinguished fellow at the Winter Park Institute of Rollins College, he was Poet Laureate of the United States from 2001 to 2003 and Poet Laureate of New York State from 2004 to 2006. The University of Arkansas Press, founded in 1980, is an academic publishing house that is part of the University of Arkansas. A member of the Association of American University Presses, it has as its central and continuing mission the publication of books that serve both the broader academic community and Arkansas and the region.